and effective for adults as well as children. While the therapeutic qualities of Jewish Penicillin are hidden, there is no doubt chicken soup works for cold in pregnancy or cold symptoms any other time of life. 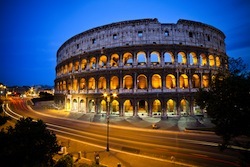 Rome was not greatly affected by the invasion of German troops during World War II. While orders were given for Italian Jews to report to internment camps, these were not followed. Ransoms in gold were offered for people in the Jewish community who stopped the SS from killing Jews and those ransoms worked as fewer than 8,000 Italian Jews were killed during the War. Before WWII, the Jewish population hovered around 39,000. Today’s Jewish community is about 45,000 strong with 15,000 living in Rome. Open the can of tomatoes and crush each tomato into the pot. Add juice from the can and all remaining ingredients and bring to a boil. Reduce heat to low and simmer uncovered for an hour. Carefully remove the chicken pieces from the pot and cool on a plate. Simmer broth for 30 minutes more. Pick meat from the chicken pieces. Place chicken pieces in the stock pot with broth. Serve in a bowl topped with fresh parmesan cheese. Variations: Roasted chicken can be used in place of boiled chicken to give this dish a rich flavor. Rome Jewish Penicillin is typically served with a side salad and garlic bread as a complete meal. The barley is full of healthy nutrition as are the tomatoes and chicken making this a hearty choice for tackling cold in pregnancy.